Luigi Saracco, the great grandfather of Paolo began growing Moscato grapes in the early 1900’s.With each generation the legacy and commitment to quality continues. Castiglione Tinella: in the heart of the Moscato d’Asti. The Saracco family has produced this aromatic wine in this area since the early 1900s and cultivating their own vineyards, which is an important part of the process, creating a link with the ideal terrain for growing Moscato grapes. The passion and professionalism shown in previous decades are continued by Paolo Saracco, Giovanni’s son and current owner, who decided to start bottling Moscato after studying oenology. And so, the Paolo Saracco label was born. This idea has allowed wine lovers in Italy and across the globe to discover a hugely aromatic, balanced Moscato d’Asti. Precise work in the vineyard and winery sought the right balance between tradition and technology. 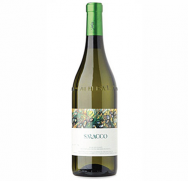 A few years later, Moscato Saracco has become a reference point in the wine industry. And it all started in the heart of the Moscato d’Asti area at Castiglione Tinella, in 50 hectares of land, as is traditional for winemakers.